In a medium (3-quart) saucepan set over medium, heat 2 tablespoons oil. When hot, add the onion and cook, stirring regularly, until it is soft and beginning to caramelize, about 7 minutes. Add the adobo and stir for one minute, then add the tomatoes and the water. Lower the heat and simmer until the mixture has the consistency of tomato paste, about 20 minutes. Scrape the sauce into a blender or food processor and process until smooth. Pour the sauce back into the pan and stir in the vinegar, agave nectar or sugar, Worcestershire and a generous ¼ teaspoon salt. Heat the oven to 325°F. Set a Dutch oven over medium-high heat and heat remaining 1 1/2 tablespoons oil. Sprinkle the meat with about 1/2 teaspoon salt, place in the hot oil and sear all sides to a rich golden brown, about 10 minutes. Pour the sauce into the Dutch oven and add 1 cup of water. Cover and slide into the middle rack of the oven. Cook until the meat is so tender that it’s nearly falling apart, about 2 to 2 ½ hours. Garnish with arugula, if desired. 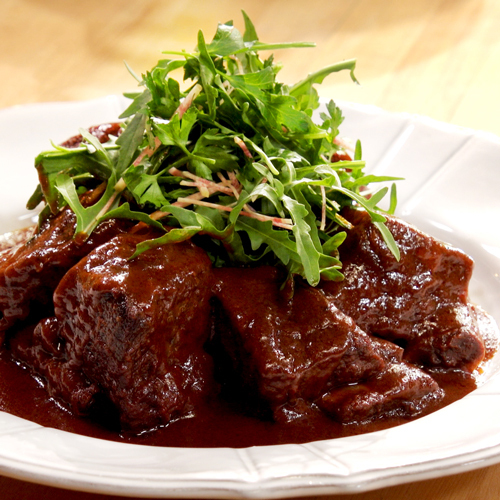 Quick Red Chile Adobo: Place 1/2 cup ancho chile powder in blender or food processor. Pour in 1-1/4 cups boiling water and pulse until smooth; cool. Place 8 peeled garlic cloves in small microwave safe bowl and cover with water. Microwave 1 minute, drain and add to blender with chile powder slurry along with 1/2 teaspoon ground cinnamon, 1/4 teaspoon black pepper, 1/8 teaspoon cumin, 1 teaspoon dried Mexican oregano, 3 tablespoons apple cider vinegar and 1-1/2 teaspoons salt. Process to a smooth puree. Transfer the adobo to a pint jar and store, covered, in the refrigerator, where it will last for a couple of months.